The Japanese tradition of the occult gets the video game treatment. If you’re fan of famous Japanese horror movies like The Ring, or The Grudge, you should check out Corpse Party, a Japanese horror game coming out on Nintendo 3DS this week. It’s got all the hallmarks of those movies, boiled down into a game. The game first came out in 1996, when it was made for PC using the RPG Maker software. As an independent doujin game, the title was a cult hit that quickly gained a following, before getting picked up by a publisher and updated first for the PlayStation Portable in 2008. The video game focuses on a group of high school students and their teacher. One night, at their school, during a going-away party for one of their friends, they decide to partake in an occult, friendship ritual that seems to go awry. The group gets trapped in the nightmarish Heavenly Host Elementary School, the scene of two tragic accidents that left two faculty dead and led to the school’s closing and eventual demolition. Like the Native American Burial Ground trope, the high school where the main cast are students was built atop the demolished elementary school, fueling the rumors of hauntings and ghosts. What surprised me the most wasn’t how the game played out, but rather how it presented itself as a true video game version of everything that makes Japanese horror tick. Visual flickers, audio cues, long-haired ghosts, and methodical, practiced delivery — these are the hallmarks of Japanese horror stories that got translated. It’s the best parts of Japanese horror classics like the aforementioned films, only in an interactive form. And this isn’t just a lazy port of an existing video game either. The 3DS does some interesting things with how it presents itself to the player. Sound goes in-and-out at times to mimic audio cues, and the visuals of the horrifying and bloody cutscenes are sometimes stalled for maximum impact. Make no mistake, there are death scenes here that would make anyone squeamish. Even some eye-related gore that would make The Walking Dead think twice. Getting video games to use their abilities as an interactive medium to do some of the storytelling heavy lifting has always been a great pleasure to encounter and Corpse Party knocks the storytelling aspect out of the park. If you’ve watched horror stories told in a Japanese school setting, you’ll know that — like the American staples of masked slasher, sadist clowns — the Japanese also have domestic tropes regarding horror. Haunted Japanese schools are no different. You’ll recognize plenty hallmarks of that here, especially if you’re a fan of horror anime. Ghost story gatherings complete with candles and props, long-haired spirits of vengeance haunting the hallways, and a prerequisite amount of local horror myths central to a specific high school that every student knows. Corpse Party relishes in these moments of everyday high school life, because it was also one of the first to turn these into a plot for a video game. As an indie darling turned cult-hit, turned franchise, Corpse Party is one of the more successful independent projects to come out of Japanese game development in the ‘90s. 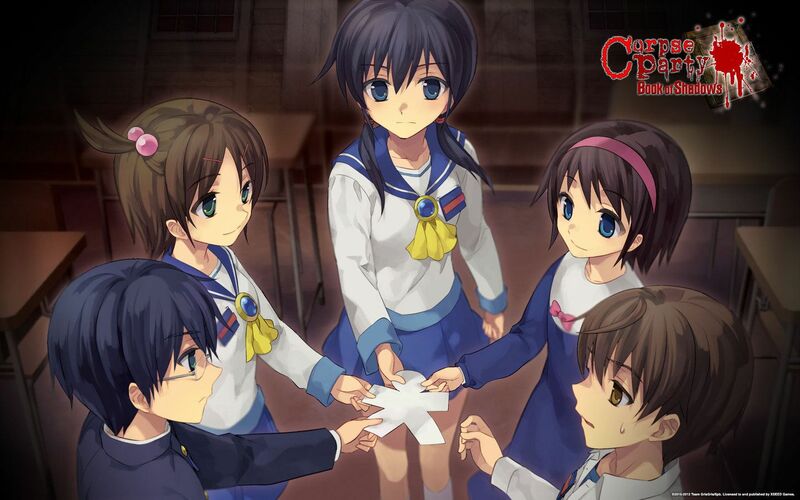 Corpse Party’s ability to package the ghost stories popular in Japanese culture is worthy of exploration. Not since Sion Sono’s Suicide Club has there been a truly interesting take on mixing horror with Japanese school life, and for that, Corpse Party largely succeeds on its presentation and clever knowledge of tropes. It’s clear it was influenced by some of the early greats in Japanese horror and is better for it.